- Papers presented on the 25th International Economic Conference – IECS 2018. 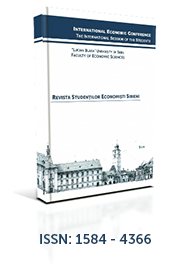 Welcome to the Revista Studenților Economiști Sibieni! This journal is an academic, interdisciplinary and peer-reviewed publication (ISSN: 1584 - 4366) published by the “Lucian Blaga” University of Sibiu. It’s goal is to publish great work from students with research potential who want to improve their writing and critical thinking skills, and to gain experience in economics publishing. Moreover, it publishes the papers presented during the International Economic Conference of Sibiu - IECS by students of undergraduate and master studies of the “Lucian Blaga” University of Sibiu as well as of students of other universities from Romania and abroad. The journal encourages the submission of manuscripts (original investigations and theoretical papers) from a wide range of academic fields, including Accounting, Applied Informatics in Economics, Business Administration, Finance, Management, Marketing. The journal is authored and edited by students working under the guidance of faculty mentors. Submissions are accepted year-round via email at iecs.student@ulbsibiu.ro. There are no charges for submission, processing or publication of manuscripts. Set yourself apart from the competition - for internships and for jobs - by publishing your scientific research!